Gadzooks, that's a lot of chocolate. There’s always a line when I visit the Homemade Ice Cream and Pie Kitchen on Bardstown Road in the Lower Highlands. The shop, one of nine locations throughout the area, is near the intersection of Baxter Avenue and Bardstown Road, a corridor filled with bars, restaurants and plenty of people who want some dessert after an evening out. Though Homemade Ice Cream and Pie Kitchen is open year-round, this location is bustling during the summer as customers skip the cakes, pies and cookies and head toward the only dessert that can provide some relief from this monstrous humidity — ice cream. Homemade Ice Cream and Pie Kitchen employees begin churning the ice cream each day at 7 a.m. They spend the rest of the day with their arm halfway down the dozens of buckets, scraping up scoops of delectable dairy to pack into cones and cups. My favorite thing about this dessert shop is its 25-cent ice cream scoop day about which I have previously blogged. For one day in the summer, Homemade Ice Cream and Pie Kitchen sells scoops of ice cream for a quarter each. As you can imagine, the lines are long and the employees are tired. But is it worth it? INDEED. Rob, Roscoe and I made our way to Homemade Ice Cream and Pie Kitchen near the end of the 25-cent scoop day. Since Rob had to wait outside with Roscoe (sorry, no pups allowed inside), he requested that I surprise him with a scoop of something with chocolate in it. I fulfilled this request fourfold when I brought Rob a scoop of Peace, Love and Chocolate, a flavor that is made up of four different kids of chocolate. Scroll back to the top of the page to take a look at Rob’s reaction to all the chocolate-y goodness of his scoop. 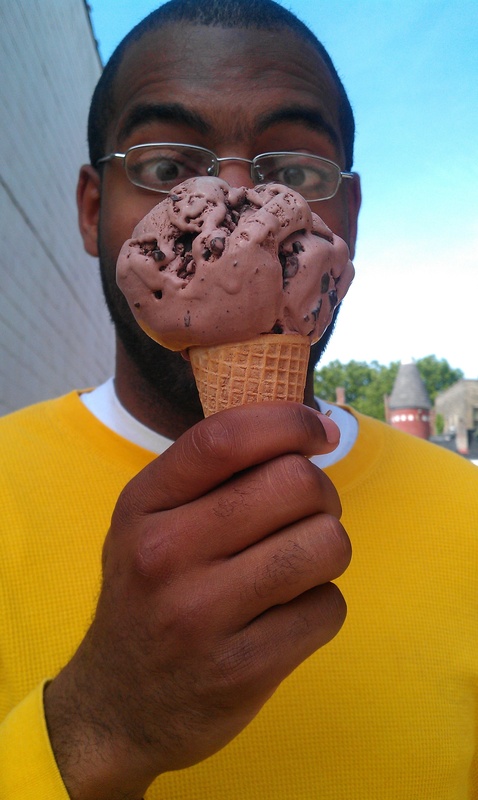 I took a lick (or two) myself. I didn’t know you could pack so much chocolate into ice cream. It tasted like the dairy equivalent of eating a handful of Hershey’s Kisses drizzled with chocolate sauce with chocolate shavings sprinkled on top. Yum. Though the 25-cent day is over, it’s still worth swinging by Homemade Ice Cream and Pie Kitchen for something sweet. That Peace, Love and Chocolate was definitely delicious enough for me to shell out the full price.